There's something about the white anemone flower that just oozes style. With it's black or deep blue centre, no wonder it pops up at so many weddings. 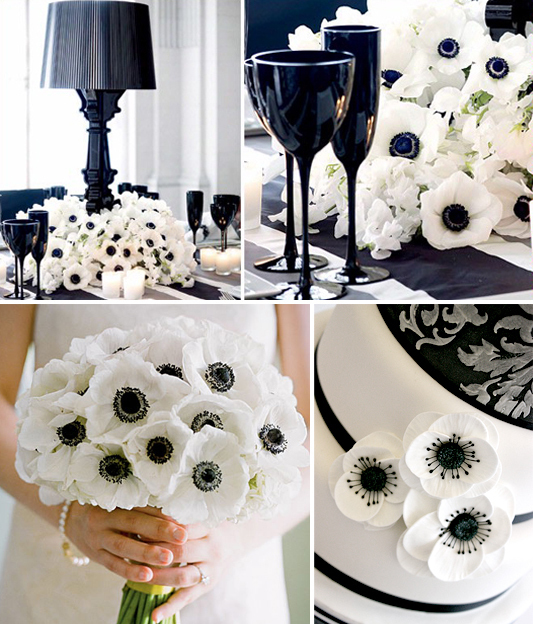 A member of the buttercup family, anemones actually come in a variety of colours from bold reds to pretty purple, but white is probably the most popular choice for weddings. Anemones are seasonal flowers, available in Australia in the winter. If you're considering working with them for your bouquet or decorations remember they can appear dried out quite quickly so they will need to be hydrated as soon as possible. Trim around 2cms off their stems at an angle, under a running tap, this will help them to soak up the water. Place into cold water right away and refresh it every day using a preservative or sugar. The anemone stem is hollow and quite brittle so when selecting your flowers watch for crushed or cracked stems and avoid yellowing leaves. Gorgeous Anemone flowers and bouquets for wedding. It fits everywhere and make that place 10 times more eye catching than before.